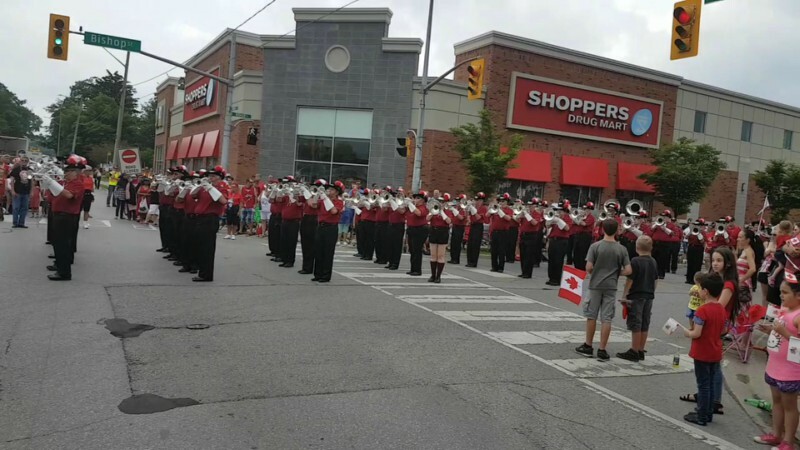 The loud cheering and shouts of support for Preston Scout House Band by Canada Day 150 parade spectators were more than a match for a torrential downpour of heavy rain and fierce head winds that swept down the main street as the Band reached the halfway point of the big parade on July 1. Many waterlogged members remarked after the one-mile parade that the cheering was the loudest they had ever heard on Canada Day. Despite the wretched conditions, most spectators held their spot on the curb and gave rousing cheers for about 100 current and former Scout House members in the special heritage band, including former drum majors Paul Bauer and Sonny Snyder, who led the Band in the1940s. Several participants wore the Band’s heritage uniform featuring tight black shorts and knee high socks. The Band finished the last block of the parade literally singing in the rain: the Band’s theme song set to the melody of Men of Harlech. Following the parade, more than 250 Scout House members, family and friends attended a barbecue at the Speedsville Columbus Hall. Those purchasing barbecue tickets had been advised to bring lawn chairs for a pleasant afternoon of socializing in the sun, but everyone ended up inside for the barbecue food, potluck salads and desserts,; entertainment by the Silver Leaves Brass Ensemble; a heritage band jam session; formal presentation of the 2017 Wilf Blum Youth Music Scholarship award to Justin Schatz and drawing of the three winning tickets in the Scout House raffle. Participation in the big parade celebrating Canada’s 150th anniversary had been billed, tongue in cheek, as the Preston Scout House Band 2017 Summer Tour. Souvenir T shirts for the event feature a big red Scout House maple leaf logo on the front and the entire summer tour schedule on the back: a one-mile parade beginning at one end of downtown and ending at the other. *Silver Leaves Brass Ensemble and percussion accompaniment, which performs at drum corps and community events throughout the year. *Heritage Drill Team, with members wearing tight black shorts, knee socks, short sleeved burgundy tunics, white gauntlets and Aussie hats as in the 1950s and ‘60s. Posted by News Editor on Monday, July 3rd, 2017. Filed under Current News, DCA News, FrontPage Feature.